• Last year Brian Dozier set the Twins' record for homers by a second baseman with 18, which came as a surprise after he totaled just 16 homers in 365 games as a minor leaguer. There was evidence that Dozier changed his approach at the plate to pull the ball more, and he's already gone deep four times in 13 games this year. I'm still not convinced he's a top-of-the-order bat, but 15-20 homers along with a solid glove would make him a long-term solution. 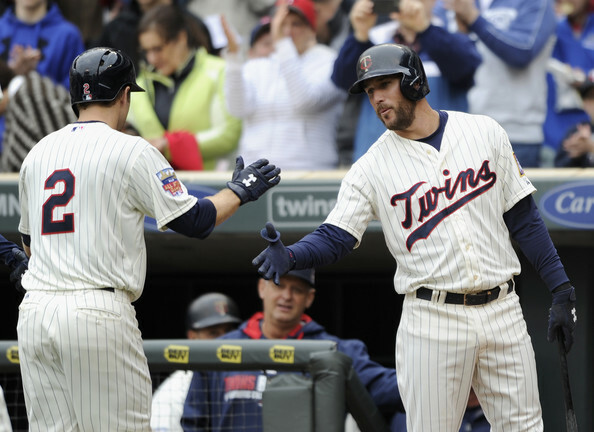 • It took 13 games for Trevor Plouffe to homer, but that might not be a bad thing because he looks like a much different hitter. He came into this season with a lifetime .240 batting average and 289/89 K/BB ratio, but so far he's hit .314 with an 8/8 K/BB ratio. His batting average will obviously go down soon enough, but Plouffe has been much more willing to push pitches to the opposite field and assuming at least some of the power remains that's a positive change. • I'm not a big Alex Presley fan because he's stretched defensively in center field and stretched offensively in a corner spot, but as backup outfielders go he's a decent one. Losing him on waivers for nothing left the Twins lacking in outfield depth and injuries to Josh Willingham and Oswaldo Arcia quickly made that a problem. When it's still early April and you're starting replacement-level talent like Chris Herrmann in an outfield corner something went wrong in the offseason planning. 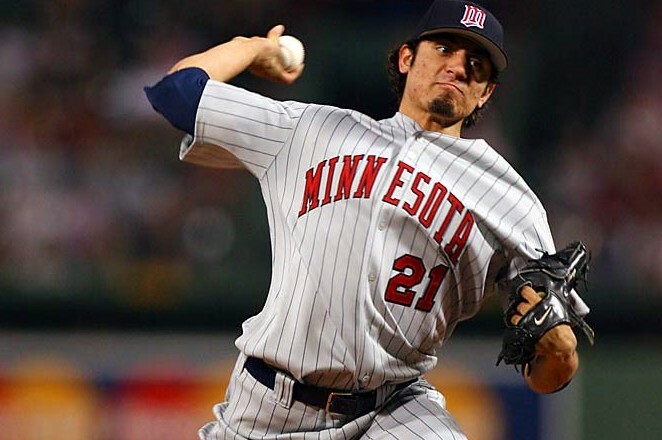 • With that said, given their current options the Twins might as well continue to trade defense for offense by using Jason Kubel and Chris Colabello in the outfield corners. For one thing their intended corner duo of Willingham and Arcia is brutal defensively anyway. Beyond that by using Kubel and Colabello somewhere other than designated hitter it also allows Josmil Pinto to get into the lineup and his long-term development could be one of the biggest keys of the season. • Back when Miguel Sano underwent Tommy John elbow surgery I wrote about how so many of the best Twins prospects of my lifetime have suffered major injuries early in their careers, ruining the chance to see what they were fully capable of becoming without any road blocks along the way. On a sadly related note, Byron Buxton hasn't played since injuring his wrist diving for a ball on March 16 and the Twins announced that he won't see game action until at least May 1. • I'm curious to see if Joe Mauer is more vocal arguing balls and strikes with umpires as a hitter now that he no longer has to help pitchers get calls from them as a catcher. That certainly seems to be the case so far, although being on the wrong end of a couple incredibly obvious terrible calls could be skewing the small sample size. Thanks in large part to Mauer's patience at the plate, the Twins lead the league in walks. • Jared Burton has had back-to-back brutal appearances despite nearly a week off between outings. Tuesday night he walked three consecutive hitters with two outs and then served up a grand slam, which really should have its own name along the same lines as a "golden sombrero" for hitters. Burton also struggled down the stretch last season, so it might be time to let him get some low-leverage work with plenty of days off mixed in. • Ron Gardenhire and assistant general manager Rob Anthony had some odd quotes about Eduardo Nunez after acquiring him from the Yankees, saying stuff like "we know he can swing the bat" and calling him an "offensive-oriented player." Meanwhile, he's 26 years old and has hit .267/.313/.379 in 270 games as a major leaguer after hitting .272/.315/.366 in 712 games as a minor leaguer. • Phil Hughes' results haven't been very good so far, but he's managed to keep the ball in the ballpark in two of his three starts and a 17/5 K/BB ratio in 15 innings will definitely work over the long haul. On the other hand even with Hughes racking up plenty of strikeouts the Twins' rotation as a whole ranks dead last among MLB teams with 5.9 strikeouts per nine innings. By comparison, four rotations are averaging more than 9.0 strikeouts per nine innings. • For anyone going to Target Field: I highly recommend the Butcher and The Boar rib tips. They're new this season in right field around Section 140 and one of the best things I've ever eaten at a baseball game. Plus for $5.50 you can get a shot of Knob Creek bourbon with them. 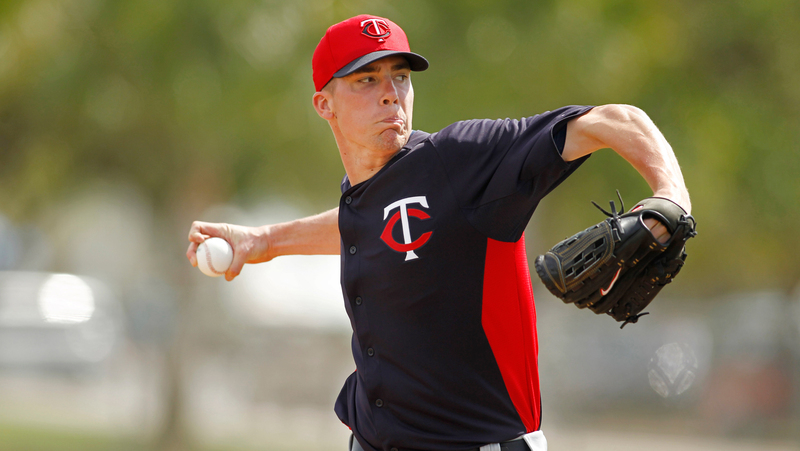 • For a lot more about Mauer, Nunez, Willingham, Arcia, Dozier, Plouffe, and Buxton--plus the sad story of how I tore my ACL--check out this week's "Gleeman and The Geek" episode.